It’s indeed a privilege for our Centre to welcome one of our senior monks of the world-wide Ramakrishna Order today. The Saturday evening Satsang tomorrow would aptly provide an opportunity to extend our warm traditional welcome to the visiting Swami. 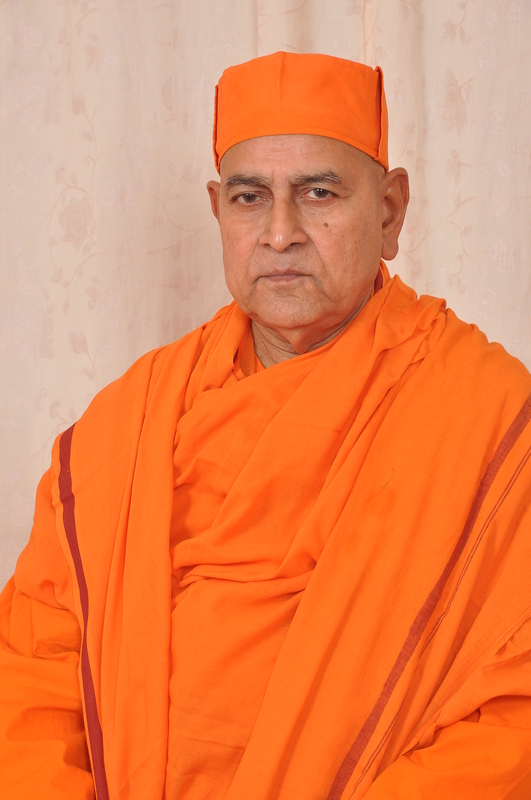 He is most Revered Swami Gautamanandaji maharaj. 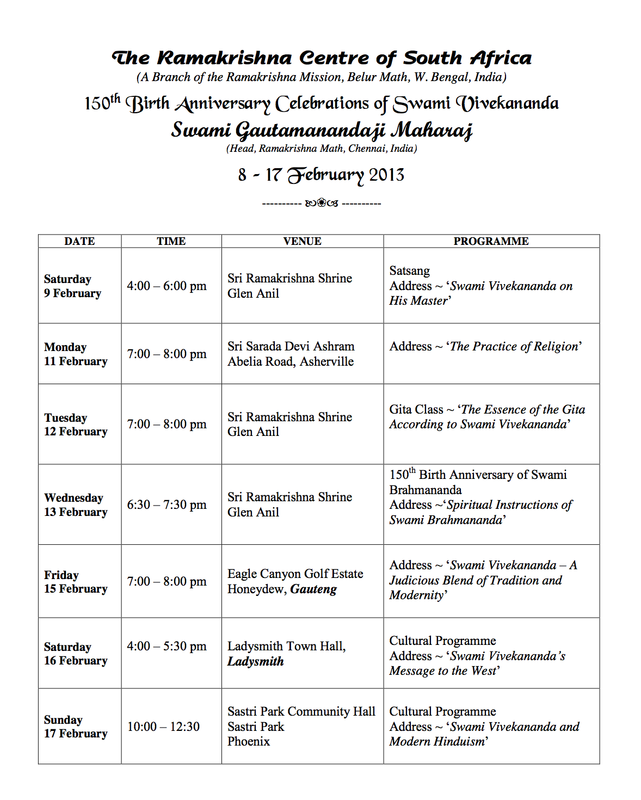 The occasion is the 150th Birth Anniversary celebration of Swami Vivekananda in this rainbow nation. He has come on a 9-day visit to South Africa. He is presently one of the Trustees of the Ramakrishna Math & Ramakrishna Mission and also holds the position of President of Sri Ramakrishna Math, Chennai. 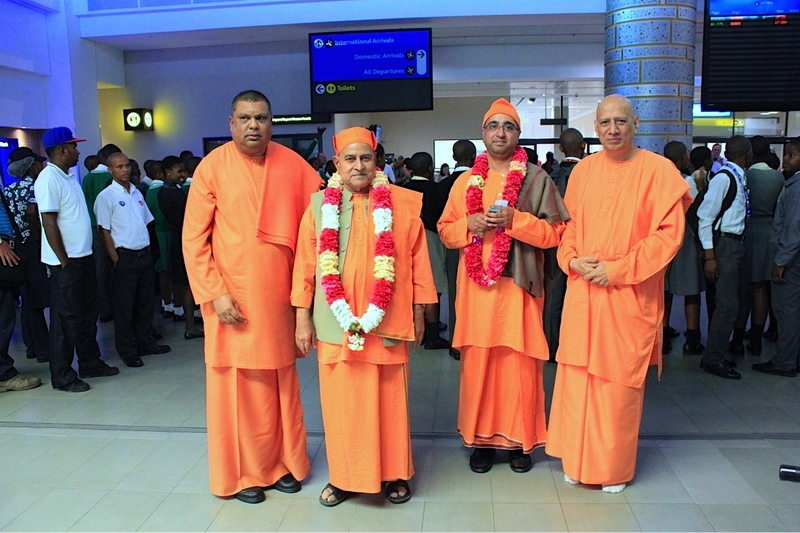 In Durban airport this evening he was heartily welcomed by brother Saradaprabhananda, officials and Self. He is accompanied by Swami Atmajnananadaji maharaj who is Secretary to the visiting Swami. They are scheduled to return on the 17th by the afternoon flight to Chennai. 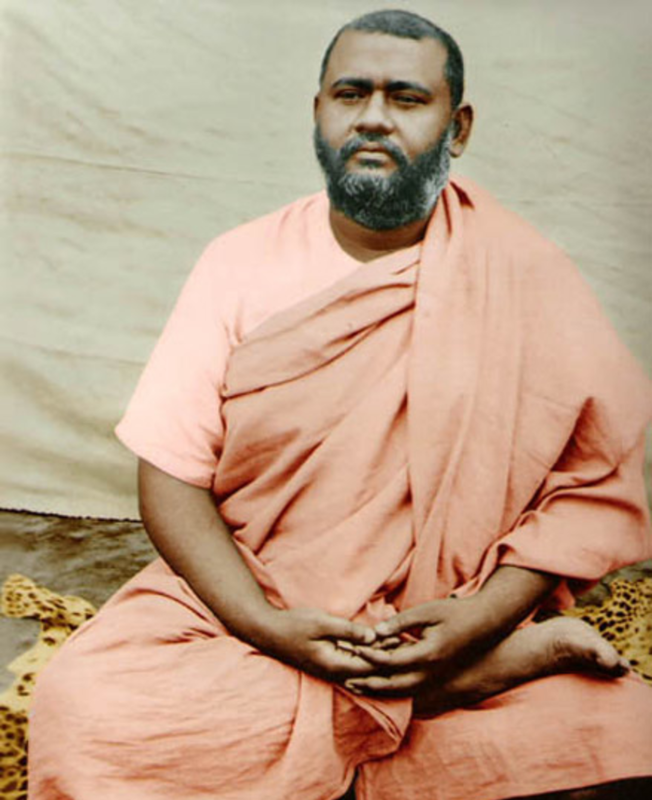 Swami Gautamanandaji joined the Ramakrishna Movement in 1951 and received his early spiritual training under Swami Ranganathanandaji and was ordained as a monk in 1966 by Swami Vireshwaranandaji, the tenth President of the Order. The Swami worked among the tribal and rural people of Arunachal Pradesh and Madhya Pradesh for 20 years vigorously promoting value-based education. He served as the General and Executive Member of the Central Board of Secondary Education and the National Council for Educational Research and Training, New Delhi, the two major National bodies of the Government of India. The Swami also worked in the Mission’s Mumbai, Kolkata, Raipur and Narainpur Centres. He was appointed a Trustee of the Ramakrishna Math and Ramakrishna Mission in 1990. In 1995 he took charge of the Ramakrishna Math in Chennai as its Head (Adhyaksha). The Swami has organised extensive relief operations in India and is an expert in India’s cultural heritage. He has lectured extensively both in India and abroad in the East and West to spread the universal message of Sri Ramakrishna in the light of Neo-Vedanta. He is proficient in English, Sanskrit, Hindi, Kannada, Tamil and Bengali. He is highly regarded for his thought-provoking lectures and has also contributed a number of articles to leading journals. In 2011, Swami Gautamanandaji was authorised to give spiritual initiation to devotees in India. This is his second trip to South Africa at the invitation of the Ramakrishna Centre. The 150th jayanti of Swami Brahmanandaji falls this year on the 12th of this month. Since on that date, several of our centres in India and abroad have scheduled a celebration, we felt that it would be beneficial for the devotees to listen to the visiting Swami on the spiritual teachings of Brahmanandaji. It is pertinent to note here that the visiting Swami is a disciple of Swami Yatishwaranandaji. Swami Yatishwaranandaji was a well-known monk for his erudition and higher spiritual living. His pioneering Vedanta work in Europe is still remembered. He was one of the disciples of Swami Brahmanandaji. Swami Gautamanandaji would be travelling to our branches that are located in Ladysmith, Phoenix and Johannesburg. He will be also making a visit to Sri Sarada Devi Ashram at Asherville in Durban on Monday, the 11th instant. He will be specially interviewed by Smt Veena Lutchman in the Lotus Radio from 5 to 6 pm on Sunday, 10th instant during the Hindu popular program ‘Bhakti Sangeet’. This will be broadcast all over the country. His public lectures have indeed interesting topics. A list is given below for your information and dear reader, if you are anywhere near the place of our branch centres, I urge you to attend the programs and do not miss the radio interview too! Happy to note that Most Revered Swami Goutamanandaji is now at your Ashrama. Sitting at Moskow I feel thrilled also. May his trip be a success! What a wonderful blesing for our devotees in SA! Almost every one in Chennai Math receive his love and blessings everyday as Maharaj never hesitates to talk to us even amidst his walking! Such a sinple unassuming and yet a great sage has come down to all at SA. A motherly sage – full of erudition, compassion and love – Great indeed, Swagatam! I had the opportunity to listen to the beautiful speech of the most Revered Swami Goutamanandaji Maharaj in our Delhi Ramakrishna Mission, on World Peace Meet. The Devotees of South Africa will get the opportunity. Thanks for sending the post! Since my return from SA, I was curiously following Chennai Math website for Revered Swami Gautamanandaji Maharaj’s agenda in February. It was posted in the Chennai Math website around January 30th. I started count down for your post on Revered Maharaj in the SA website. Fortunately and surprisingly I received this post from you. It is a soul refreshing experience to see Revered Maharaj’s majestic appearance in the post. I recently talked to Revered Swami Archanandaji who is a native of our district. He mentioned to me his association with Revered Swami Gautamanandaji. Revered Archanandaji is no more associated with the order. Presently, he is spreading the message of the Holy Trio in our district. He is still in touch with Revered Gautamanandaji and other monks of the order. Indeed such a joyous occasion! The sons of Sri Ramakrishna are like a fragrance of full-bloomed flower. They bring joy of devotion to everyone around them. I hope all the devotees of South Africa will be overjoyed with the beautiful sadhu-sanga. Glories to the incarnation of Love! I am happy that all the devotees would have a glorious time with him……My pranam to him..
After a long time I get an oppertunity to check the mail because Jayanta was transferred to Bangalore again. Now I am in Bangalore. I will be back on 2nd March. So I can’t read your blog. How are you maharaj? Thank you for sending the post. But I lost the opportunity to connect with you & read this great blog.